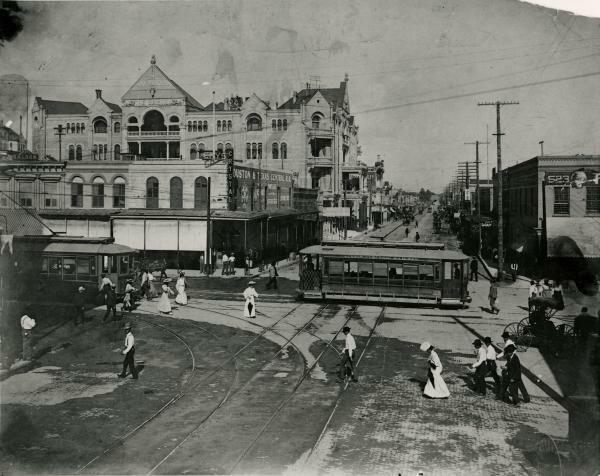 Historic Sixth Street and the Driskill Hotel. C00146, Austin History Center, Austin Public Library. Italian immigrant Michael Paggi operated a carriage shop on property he owned at 421 E. Sixth St. (now Pete&apos;s Dueling Piano Bar) from 1875 to 1905. Former slave E. H. Carrington, followed by son-in-law D. H. Lyons, owned a successful grocery at 522 E. Sixth St. (next to modern day Easy Tiger) from 1873 to the 1940s and both were African American community leaders. Starting around 1921, Ben Garza and his brothers owned a meat market in the Randerson-Lundell Building, 701 E. Sixth St., for many years. Today, crowds of music lovers and revelers keep the old buildings young. Austin founder Mirabeau Lamar’s 1839 plan called for a public open space in each quadrant of the city. One of those spaces, Brush Square, is home now to three museums. The 1869 home of Alamo survivor Susanna Dickinson was built by husband Joseph Hannig. 411 E. Fifth St. 512-974-3830. susannadickinsonmuseum.org. William Sydney Porter, who later found fame as short-story writer O. Henry, lived in this 1886 Victorian cottage. Visit this spring an experience "Once A-Pun a Time: 40 Years of the Pun-Off," an exhibition celebrating one of Austin&apos;s weirdest (and punniest) annual events. 409 E. Fifth St. 512-472-1903. ohenrymuseum.org. The 1938 Moderne-style Fire Station No. 1 houses the Austin Fire Museum. 401 E. Fifth St. Free. austinfiremuseum.org. Follow along with our journey across historic Austin on the Insider Blog, hop on a historic downtown walking tour at the Austin Visitor Center and download free smartphone tours of Austin’s historic places at preservationaustin.org/programs/historic-austin-tour-ap.